Aluminium turning scrap available in Mumbai, clean attachment, please feel free to contact us gor further information. We offer Aluminum Turning generally termed as aluminium starters required in the pharmaceutical companies for reaction. 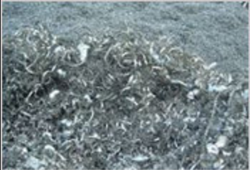 This is not the ordinary aluminium scrap but the special alloy with specific chemical composition. Our range are available at various designs, shapes and sizes. These are available at most competitive prices. Aluminium turnings are used in many pharmaceutical plants in the chemical reactors. Experience the efficient and exceptional cutting performance.